World Resources Institute (WRI) and IUCN, South Dakota State University, on behalf of the Forest Landscape Restoration Global Partnership. Authors: Peter Potapov, South Dakota State University ; Lars Laestadius, World Resources Institute ; Susan Minnemeyer, World Resources Institute ; Carole Saint-Laurent, Global Partnership on Forest Landscape Protection. Forests once covered almost twice the area that they do today. Today the loss is continuing at the rapid pace of roughly 13 million has per year. While the focus of the international forest and climate debate has been on avoiding further deforestation and degradation of forests in developing, often tropical, countries, these discussions have begun to acknowledge the potential for forest restoration to enhance carbon stocks and increase resilience to the impacts of climate change. Forests can recover. Restoration of degraded lands is receiving increasing attention because of growing demand for forest products and bioenergy, and for the potential to create socio-economic opportunities, increase carbon densities, contribute to food security, and adapt to climate change. The amount of land in need of restoration appears to be huge. Until now, however, very little was known about the scope, extent, geographical variation, and priorities of the restoration potential. This activity, implemented by World Resources Institute and IUCN, on behalf of the Forest Landscape Restoration Global Partnership, aimed to assess the potential for forest landscape restoration worldwide and create awareness of this potential among decision-makers and the public. A range of possible restoration purposes will be considered including restoration of ecosystem services, increasing carbon density, and creating of livelihood opportunities. Preliminary findings from this global assessment indicated that there is a total area of lost and degraded forest lands of more than 1 billion hectares worldwide that is suitable and available for restoration – an area greater than that of China. Further research increased that area to more than 2 billion hectares. 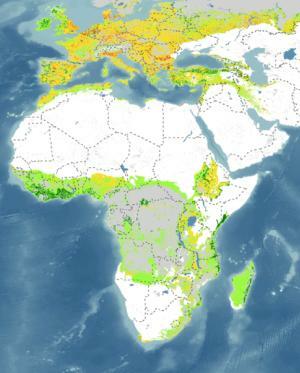 The activity authors have produced a map showing where global forests have great potential for recovery. While many maps show forest loss, this one is the first of its kind to show areas where forests could be regained. This has significant implications for climate negotiators that are working to reduce and reverse carbon emissions from forests. An estimated billion and a half hectares of deforested and degraded forest land offer opportunities for forest landscape restoration, either wide-scale or mosaic type. About two thirds of the potential is on deforested lands; the rest is in degraded forests and woodlands. Additional restoration opportunities -— mainly for protective purposes – are scattered within the world’s croplands. The restoration opportunities are typically not located in areas of ongoing deforestation and degradation; they tend to occur where degradation and deforestation have already made their mark. These areas should not all be restored in the same fashion. There is no one-size-fits-all solution. Each forest landscape is unique and needs its own restoration design which responds in a balanced way to societal preferences and needs. Lands that are currently used for crop production or grazing, for example, are not suitable for wide-scale restoration. They may, however, offer opportunities for restoration in mixed land-use mosaics. Many historically deforested areas belong to this category. The main finding -- landscape restoration opportunities worldwide on a huge scale -- was presented at a Ministerial Roundtable on Forest Landscape Restoration, held in London, on November 26, 2009, as well as during Forest Day 3 and 4 on the sidelines of the UNFCCC climate change talks in Copenhagen and Cancun.